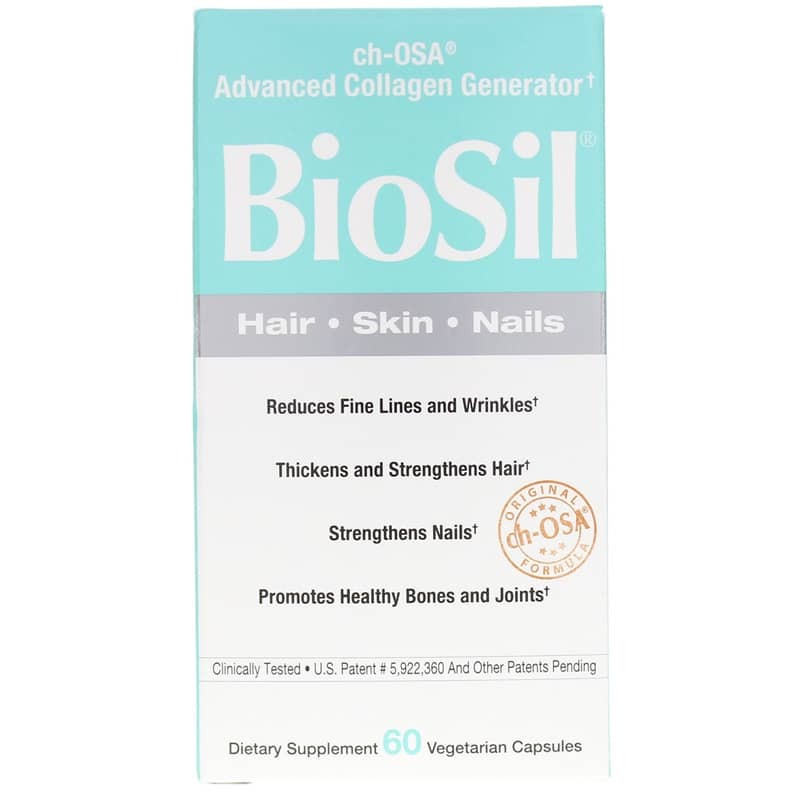 Biosil Advanced Collagen Generator from Natural Factors helps strengthen hair and nails and reduce fine lines and wrinkles in skin. In order to keep our nails strong, our hair thick and strong, and our skin looking more youthful, our body needs collagen, keratin and elastin. BioSil Advanced Collagen Generator with ch-OSA contains these three important "beauty proteins." Collagen helps plump skin to help reduce the formation of wrinkles and fine lines. It also promotes healthy bones and joints. Keratin gives hair thickness, body and strength. 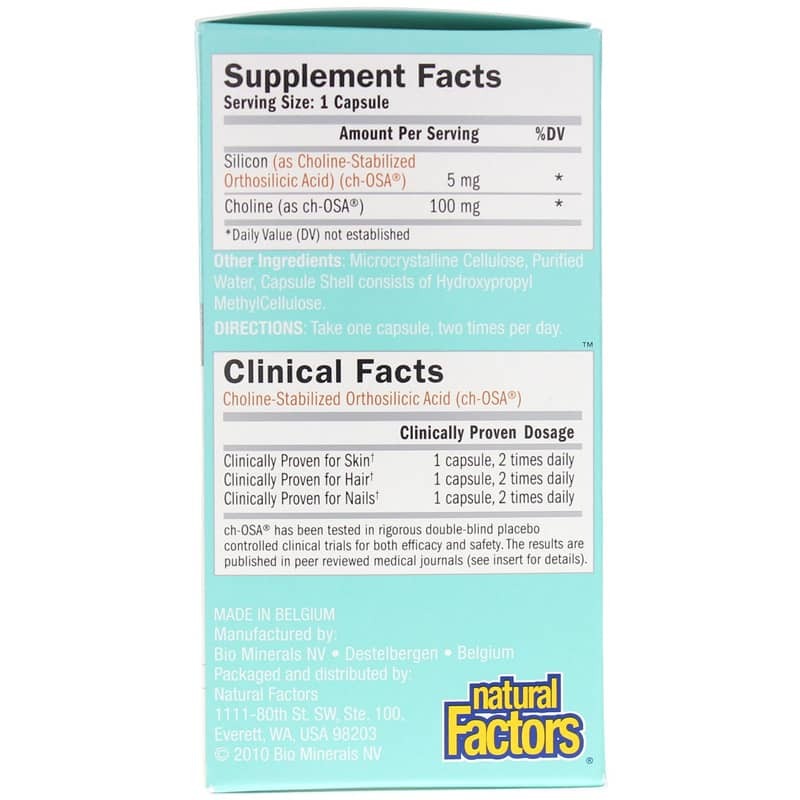 Biosil Advanced Collagen Generator from Natural Factors helps nurture these three proteins to help promote and maintain more youthful strength and beauty. Contains NO soy, dairy, egg, corn, wheat, gluten, fish/shellfish, nuts or tree nuts and is suitable for vegetarians. Contains NO: soy, dairy, egg, corn, wheat, gluten, fish, shellfish, nuts, tree nuts. Adults: Take one capsule, two times daily. This is the second bottle of BioSil Hair Skin Nails Capsules I bought because I noticed a definite difference in my hair. BioSil Hair Skin Nails Caps works wonderfully! People have complimented my hair and nails. I have not seen much improvement. Been taking BioSil Hair Skin Nails Caps for three months. Maybe it takes longer. This company is my new go-to online source for vitamins. I've been ordering vitamins online for years, and this was the best experience I've ever had. So glad I found Natural Factors!